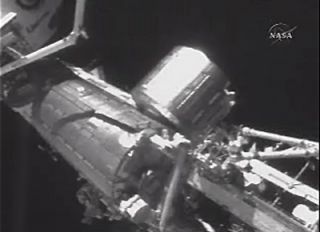 Japan's Kibo laboratory is seen with its rooftop storage room in place in this still image taken on June 6, 2008 from a camera outside the ISS. Thisstory was updated at 8:32 p.m. EDT. HOUSTON -The International Space Station?s (ISS) giant Japanese laboratory got a secondroom Friday after astronauts attached its attic-like storage room. Wieldingthe space station?s robotic arm, astronauts plucked the small storage room froma temporary berth and stuck it atopits permanent home on the roof of Japan?s new tour bus-sized Kibolaboratory. ?Good job,?said Japanese astronaut Akihiko Hoshide after his crewmate, NASA astronautKaren Nyberg, eased the storage room into place at about 3:58 p.m. EDT (1958GMT). Hoshide and station flight engineer Greg Chamitoff locked the spareKibo room in place a few minutes later. The storageroom, known as the Japanese Logistics Module, is a squat cylinder about 14.4feet (4.4 meters) wide designed to hold spare parts, experiments and otherequipment for Japan?s $1 billion main Kibo lab. It arrived last March to awaitits parent module. Discoveryshuttle astronauts delivered the 37-foot (11 meter) Kibo laboratory earlierthis week, then bounced off its curved walls in an adhoc opening ceremony before filling it with phone booth-sized equipmentracks. ?It?sawesome to enter a completely new module,? station commander Sergei Volkov toldreporters Friday during a series of televised interviews. ?It?s veryimpressive.? While itmay not that new car smell, Discovery?s commander Mark Kelly - who has calledthe Kibo laboratory the ?Lexusof station modules? - said Friday that giant room does have a ?new carfeel.? ?It?sincredibly big,? Kelly said in the interviews. ?A lot of room, you have to beextra careful. You can get out in the middle and you can?t reach a handrail,and you can get kind of stuck there for a while.? Japan?sKibo lab is the third new room for the space station this year and the third researchlaboratory to be installed at the orbiting outpost. The European Columbuslaboratory arrived in February to join NASA?s U.S. Destiny laboratory alreadyaboard the station. Russia?sZarya control and Zvezda service modules, and two airlocks, round out thestation?s main rooms, which are connected by berthing points or smallerconnecting nodes. But the32,000-pound (14,514-kg) Kibo lab is the largest of the station?s orbital roomsand is still incomplete. A porch-like exterior platform is slated to launchaboard a NASA space shuttle next year to be attached to the end of the module,which sports two windows, a small airlock and a robotic arm to manipulateexternal experiments. A smaller arm will also arrive with the new platform. Astronautsalso planned to power up Kibo?s main 33-foot (10-meter) robotic arm today toprepare for its first checkouts tomorrow. A spacewalk, the third of Discovery?sSTS-124 mission, is on tap for Sunday to replace an empty nitrogen tank forthe station?s cooling system. Once thatlast spacewalk is complete, the astronauts are expected to reopen Kibo?s atticstorage space for good on Monday, mission managers said. ?We?regoing to make some pretty interesting scientific discoveries,? Kelly said ofthe Kibo lab, adding that with a larger space comes more room for science. ?It?s a big deal not only for Japan, the United States and Russia and theEuropean partners and Canadians, but I think it?s a big deal for everybody onthe planet.? NASA is broadcasting Discovery's STS-124 mission live onNASA TV on Saturday. Click herefor SPACE.com's shuttle mission updates and NASA TV feed.